Merry Christmas! We constantly reflect on our days together in Texas. Especially at this special time of year, we feel so blessed to have shared that sacred service with each of you. A special thanks to all who have written, called or dropped by with your love and Holiday greetings. Please excuse us as we respond to you all in a more public way. Below you will find our family’s Christmas letter with a few pictures and commentary on 2008. We hope you will enjoy. It is our testimony that we WILL be ready for Christmas by becoming faithfully and completely ready for Christ! Remember…Faith, Obedience, Diligence . Those lessons learned in the mission field will help you stay on course. May we seek Him so that He will forever be the center of our lives ----not only at Christmastime, but each and every day of the year. May the Lord bless you with a magnificent 2009! Kristin, Greg & Madi packed up and headed north to Boise! Though they miss family and friends back in Utah they LOVE their new home (and Madi loves that she is only 5 minutes away from her cousin Ty Ty). Their beautiful, vibrant Madi will be 2 in January and is definitely in charge. She is talking up a storm and has a great love for music and singing…sometimes even right in tune! She is adored by her parents who love every second with her. In addition to Greg’s work with APX Security Systems, Madi’s mom and dad are getting ready to launch some fun , new business ventures and are excited for 2009 and beyond. They are SO very happy and most of all grateful for the Lord and His many blessings this Christmas season. Camee, Matt and little Ty are still in Boise are excited to welcome a new little sister to the family. (She’s due to arrive near her Uncle McKay’s birthday, Feb 7). Ty just turned 2 earlier this month and is the cutest!! He loves cars and his cousin Madi! He is always on the go and can brighten anyone’s day with his adorable smile. Matt is going to school at Boise State and will be managing with APX Security Systems again this summer. Although Camee ran the field office for APX last year, this summer with 2 kids on her hip instead of just one, she’s excited to just be a Mom. They have recently been called to serve in the Spanish Branch of their Stake, Matt in the Elders Quorum Presidency and Camee in the Young Women’s Presidency. ( Camee’s Spanish carries a fun, little Japanese twang). McKay returned in January from a very successful mission in Chile. Mom and Dad were blessed to travel to Vina Del Mar, where they met him and spent a few days meeting his Mission President and wife along with many of the wonderful Chilean people Elder Crockett grew to love. We also did a little missionary work before returning to the states. Muy Bueno! He is now continuing his education at BYU as a Music Media major. He is also a member of the popular BYU a cappella performing group “ Vocal Point.” It’s great to see McKay back on stage again! He also found time to return to Brighton and choreograph the musical “Grease” for his old high school alma mater. Last summer McKay enjoyed a very successful sales season working with APX Security Systems. This year he will return as an assistant manager working along side Matt and Greg. This boy sure knows how to keep busy!! Can you believe that Cortnee graduated from High School in June and is now a freshman in college!?! 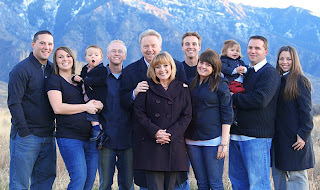 Our baby now attends UVU in Provo, living in the same apartment complex and attending the same student ward as McKay. She is majoring in elementary education. Her love of soccer continues as she played on not one, but TWO intra-mural soccer teams this fall. She has many special friends that have left recently on their missions ( one in particular) which keeps her busy writing letters. After 3 years in Texas as a missionary, she is now getting to know the “other side” of mission life. Speaking of Texas, she keeps in constant touch with her wonderful Texas BFFL (… best friends for life… for those of you who don’t speak text). We love our Cort!! Teri and Den ( aka Mom and Dad, Grammy and Grandpa) are still adjusting to after-mission life but slowly seem to be gaining on it. Den is getting back to the workplace while Teri is enthusiastically polishing her grand-parenting skills! We have loved spending time with our children, whether it be going on tour with the HS Choir, attending soccer games, Vocal Point performances, watching a certain coach on the sidelines or just those Sunday dinner get -togethers. What joy there is in family. 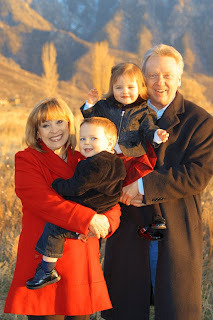 We have also enjoyed EVERY second of being Grandparents! What a sweet blessing it is to watch our children ---and THEIR children--- grow and develop. We have loved serving together this year in several wonderful Church callings ; teaching the stake Senior Missionary Preparation class ; a General Church assignment of coordinating the visiting choirs that perform in each General Conference ( April and October); and, most recently we have been called as the Chairmen for the upcoming Temple Dedication Celebration that will coincide with the dedication of the new Draper and Oquirrh Temples in 2009. This “youth event” is similar to those cultural evenings that have been associated with temple dedications worldwide. This will be the first such Celebration to be held in the Salt Lake Valley. We are working on this project with some of the most talented, dedicated and inspiring people. We expect it to be powerful and inspirational event for the nearly 15,000 youth and their families that live in these 2 Temple districts. Keep us in your prayers. We will need it! We want to convey to you our love and sincere wishes for a blessed Christmas . May this Season be filled with the peace and joy of loved ones near. And may your New Year be happy, healthy and prosperous. Most of all we send to you our witness that the Babe of Bethlehem IS the Savior of the World. And that He is THE source of all that is good. Camee, Matt & Ty ( and ?? ), Denny the Younger! Merry Christmas! It was great to get your letter and hear from you!